For the English national flag, see Flag of England. For the Glasgow subway station, see St George's Cross subway station. Not to be confused with the Cross of St. George, a Russian military distinction, or the George Cross, a British medal. 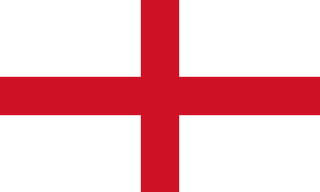 The Cross of Saint George as a rectangular (3:5 ratio) flag, used as the contemporary flag of England. Associated with the crusades, the red-on-white cross has its origins in the 12th century. It may have been used as the ensign of the Republic of Genoa as early as during the 13th century. The symbol has since been adopted by the Swabian League in the pre-Reformation Holy Roman Empire. The red-on-white cross used extensively across Northern Italy as the symbol of Bologna, Padua, Genoa, Reggio Emilia, Mantua, Vercelli, Alessandria, is instead derived from an older flag, called the "Cross of Saint Ambrose", adopted by the Commune of Milan in 1045. Saint George also rose to the position of "patron saint" of England after the English reformation, and since the early modern period his flag came to be identified as the national flag of England. Saint George is the patron saint of Catalonia and also of Georgia, and the national flag of Georgia (2004) displays a combination of Saint George's cross and the Jerusalem cross. 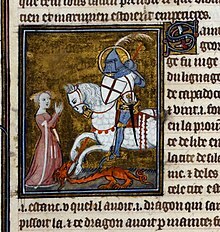 Saint George became widely venerated as a warrior saint during the Third Crusade. There was a legend that he had miraculously assisted Godfrey of Bouillon; also that Richard the Lionheart had placed himself under his protection. According to legend, the crusaders received miraculous help at the siege of Antioch on 28 June 1098 from a great army on white horses, clothed in white and bearing white banners, led by St George, St Demetrius, and St Mercurius. However, there was no association of the red cross with St George before the end of the crusades. 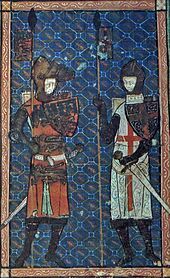 The red cross in particular was associated with the Knights Templar, from the time of the Second Crusade (1145), but in 1188 red and white crosses were chosen to identify the French and English troops in the "Kings' Crusade" of Philip II of France and Henry II of England, respectively. Together with the Jerusalem Cross, the plain red-on-white became a recognizable symbol of the crusader from about 1190, and in the 13th century it came to be used as a standard or emblem by numerous leaders or polities who wanted to associate themselves with the crusades. [clarification needed] The red-on-white combination was chosen by Genoa and Aragon, among others. 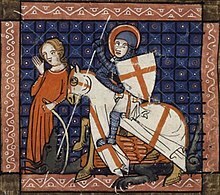 Saint George was depicted as a crusader knight during this time, but the red cross had no particular association with him. A crusader-era fresco in the crypt of Trani cathedral shows Saint George wearing a white cross on a red surcoat. The white-on-red version was chosen as the Reichsbanner ("imperial banner") by the German crusaders in the 12th century, and Emperor Frederick II used it in his European campaigns of the 1250s after he had returned from the crusades. It continued to be used as the Reichssturmfahne ("imperial war flag") of the Holy Roman Empire, eventually giving rise to the flag of Savoy and the present-day flags of Switzerland and Denmark). A vexillum beati Georgii is mentioned in the Genovese annals for the year 1198, referring to a red flag with a depiction of St George and the dragon. An illumination[clarification needed] of this flag is shown in the annals for the year 1227. The Genoese flag with the red cross was used alongside this "George's flag", from at least 1218, and was known as the insignia cruxata comunis Janue ("cross ensign of the commune of Janua"). The flag showing the saint himself was the city's principal war flag, but the flag showing the plain cross was used alongside it in the 1240s. 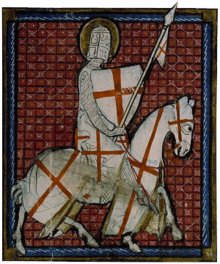 Early representations of Saint George as a crusader knight with bearing a red-on-white cross still date to the late 13th century, and become widespread as the saint's attributed arms in the 14th and 15th centuries. Edward III of England chose Saint George as the patron saint of his Order of the Garter in 1348, and also took to using a red-on-white cross in the hoist of his Royal Standard. Saint George with an earl of Lancaster (probably Edmund Crouchback), from an English Book of Hours, c. 1330. 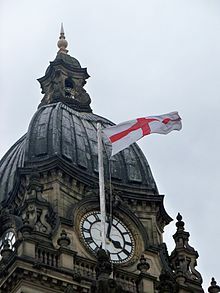 Saint George's flag flying on Leeds Town Hall (2009). "The St. George's flag, a red cross on a white field, was adopted by England and the City of London in 1190 for their ships entering the Mediterranean to benefit from the protection of the Genoese fleet. The English Monarch paid an annual tribute to the Doge of Genoa for this privilege." The red cross was introduced to England by the late 13th century, but not as a flag, and not at the time associated with Saint George. It was worn by English soldiers as an identification from the early years of the reign of Edward I (1270s), and perhaps originated a few years earlier, in the Second Barons' War (specifically in the Battle of Evesham of 1265, during which, according to chronicler William Rishanger, Simon de Montford observed that the king had taken from him the idea of having his soldiers marked with a cross). Saint George rose to the position of "patron saint of England" in a process beginning in 1348 with the foundation of the Order of the Garter and culminating with the abolition of all saint's banners except for the St George's banner in 1552. From 1348 and throughout the 15th century, the Saint George's Cross was shown in the hoist of the Royal Standards of the Plantagenet kings of England. A combined British flag was created in 1606 (after the dynastic union of England and Scotland in 1603, the so-called "Union of the Crowns") by combining Saint George's Cross with the Saint Andrew's Cross (the flag of Scotland). The flag was initially for maritime display, later restricted to the King's ships. Afterwards, the Saint George flag remained the flag of England for other purposes until the Acts of Union 1707. At the union, the first Union Flag became official for all purposes in the new Kingdom of Great Britain. From this time, the Saint Georges Cross came to be seen as a symbol of England and Wales when used alongside symbols for Scotland or Ireland; so in the flags of the Commonwealth of England during 1649 to 1660. The flag of Saint George is also the rank flag of an Admiral in the Royal Navy, and civilian craft are forbidden to fly it. However, surviving little ships of Dunkirk, which participated in the Dunkirk evacuation during World War II, are allowed to fly it as a jack. This is normally done in the defaced form of the Dunkirk jack. Churches belonging to the Church of England may fly the Saint George's Cross (unless another flag is flown by custom for special reasons). The correct way for the church to fly the Saint George's cross (since an order from the Earl Marshal in 1938) is with the arms of the diocese in the upper left-hand corner of the flag. The flag of St George has enjoyed a resurgence in popularity since the late 20th century, partly due to football-inspired nationalism, and also in response to the devolution movements in Scotland and Wales. During the 2010 World Cup, UK Prime Minister David Cameron told Parliament that the flag would fly above his official residence at "no extra cost to the tax payer" while England played in the contest. Guernsey was permitted to use the Saint George's Cross as its state flag between 1936 and 1985. The coat of arms of Montreal, first used in 1833, had a Saint Patrick's cross with the floral emblems of England, Scotland, Ireland, and France in its four quarters. The cross was changed to a Saint George's Cross in 1938, representing England's dominating influence over Canada, and a city flag in the form of the arms was adopted the following year. The city of Nanaimo in British Columbia also uses a Saint George's Cross on its flag and arms with a ship and pieces of coal, its former main export. Three Canadian provinces and one territory use the Saint George's Cross on their coats of arms: Alberta, Manitoba, Ontario and Yukon, again reflecting England's influence in Canada. The state badge of the Australian state of New South Wales features Saint George's cross with a golden lion passant guardant in the centre of the cross and a golden eight pointed star on each of the cross limbs. Saint George is the patron saint of the nation of Georgia, and the Saint George flag was supposedly used in the 5th century by Georgian king Vakhtang Gorgasali. [dubious – discuss] In the 13th century, Queen Tamar of Georgia used the Saint George flag during her campaign against Seljuk Turks. The four Jerusalem crosses were later added by King George V of Georgia, who drove out the Mongols from Georgia in 1334. The flag fell out during the Russian annexation of Georgia and abolition of the Georgian monarchy. However, the flag was revived by the Georgian patriotic movement in the 1990s. A majority of Georgians supported the restoration of the medieval flag of Georgia, including the influential Catholicos-Patriarch of All Georgia Ilia II of the Georgian Orthodox Church. The flag was finally adopted by the Georgian parliament on January 14, 2004. It was formally endorsed by a presidential decree signed by Mikheil Saakashvili on January 25, following his election as President of Georgia. The flag of Barcelona combines the cross of Saint George, the patron saint of the city, with the traditional red and yellow bars of the Senyera, the ancient symbol of the Crown of Aragon (here, the bars are vertical, though the modern flag of Catalonia has horizontal stripes). The flag and arms of Freiburg im Breisgau, Germany, consist of a St George's Cross, as St George is one of the city's patron saints. In Sweden, the term "Saint George's cross" sometimes refers to the Cross pattée used by Swedish Freemasons. ^ Official site of Commune of Milan. Historical background. The chronacles say it was chosen as a melting of the ancient white flag of Milanese plebs, attested in 1038 during Conrad II's siege of Milan, and the red cross pattée as an ancient symbol of Lombard nobility. It is also attested, in this elder version, in a diplomatic letter dated 1155. See also: Evolution of Milan's flag. ^ Perrin, British Flags (1922), p. 20: "they imagined that they had seen a great army on white horses, clothed in white and bearing white banners in their hands, issue from the neighbouring mountains and come to their assistance. The leaders of this ghostly army, recognised by their names written on their banners, were St George, Saint Demetrius, and St Mercurius. If at this time the red cross had become the distinctive sign of St George one or other of these writers would surely have mentioned it, but all agree that the banners were white." ^ Fuller, A Supplement of the Historie of the Holy Warre (Book V), 1647, chapter 4. ^ Perrin, British Flags, 1922, p. 20. ^ "[W]hen Montfort saw the advance of the royal troops [wearing a red cross as their distinguishing mark], he exclaimed that 'They have not learned that for themselves, but were taught it by me.'" M. Prestwich, Plantagenet England: 1225-1360 (2005), p. 51. ^ McCarthy, Michael (23 April 2010). "Identity parade: What do flags say about nations – and human nature?". The Independent. Retrieved 12 January 2012. ^ Herreros i Agüí, Sebastià (2005). "La bandera de Barcelona, 1991-2005" [The flag of Barcelona, 1991-2005] (PDF). International Congress of Vexillology - Vexilobaires. Retrieved 28 July 2018. Wikimedia Commons has media related to Saint George in heraldry.